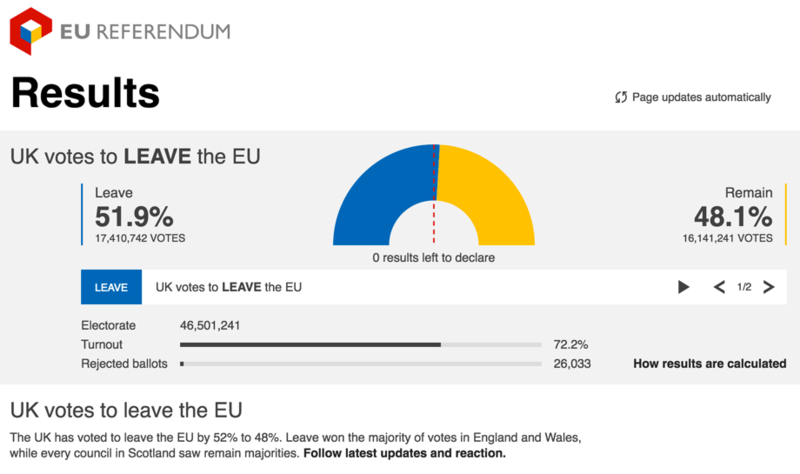 For good or bad, 23 June 2016 will go down in history as the day Britain voted to leave the European Union; the first country to do so. Where was I when this went down? Singapore, the fourth most expensive city in the world, for RedDotRubyConf, and it literally got more expensive for me overnight as the Pound took a hammering too. Despite what either campaign says, no one really knows what is going to happen over the coming years. Yes things will change, but no one really knows what or how. The economy may tank, it may boom. Scotland may leave the United Kingdom, it may not. Other countries may leave the EU, they may not. We really don't know. All we really know is there will be changes and these are not going to be overnight. It's going to be a very interesting and bumpy ride over the coming years and think about it, we'll now have something other than the weather to moan about :stuck_out_tongue:.